Yesterday, I was chatting on Skype with my friend from Italy. We have known each other for years and he was always great help whenever I needed to translate something into Italian, or when I needed to understand specific local vocabulary (I love the sound and meaning of “sfigato” for example) or the meaning of various hand gestures (it seems to me that when Italians speak, they always have their hands in front of their noses moving in wild gestures). Our chat yesterday evolved around an update on the children before turning into how he – my friend – got scammed by bunch of crooks. I thought he was quite unfortunate because of the consequences for him (can’t really go into the details) and because Italy is a rather safe place … at least based on the EUROSTAT statistics which monitor all crimes reported to the police. And since we are in on-line security business, and since EUROSTAT has loads of data on the ON LINE USAGE and CRIME, I pulled out a couple of reports for you as well. (40%) Even though I’d call that nuisance and not necessary a crime. computer infection which resulted in loss of data or time. - 3% said their private data was abused. - 2% say their children were hit by visiting inappropriate websites. - 2% say they actually lost money through some on-line fraud. 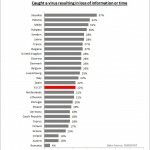 If I would count only the severe threats (abuse of personal data, hits on children or loss of money), there are 7% of Europeans who have been victims to such online crime. And that is more than the average for standard crimes. 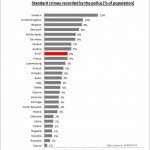 What is also interesting is where the European “winners” are with the highest on-line crime rates: Latvia, UK and Netherlands. And since we are an antivirus company, the last overview that I pulled out was the country overview of virus attacks resulting in loss of data or time. Here the “winners” are Slovakia, Estonia and Malta. The countries with least reported virus hits are Ireland, Austria and Romania. BTW, In addition to Italian vocabulary I also love stats. So if you have similar data for the USA or other countries, please share it with me.